Last night, for the first time ever, I baked a cake in a silicone bundt pan. GASP! Yup, I faced one of my biggest baking fears, bit the bullet, and used a flimsy, flexible, hard-to-keep-lint-out-because-it-sticks-to-the-pan red Wilton silicone pan. I went to a friend's to bake a cake and even brought my conventional metal, fail-proof pan with me. 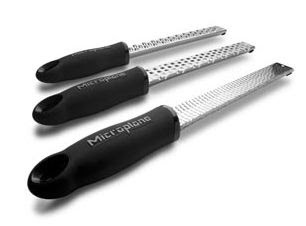 It's heavy-duty, and I've used it enough times to know it does my cakes justice. But when my friend presented me with her silicone alternative, all feelings of safeness and ease were chucked out the window and a sinking feeling overwhelmed me. Should I use the pan I brought that I know works? Or should I try this wobbly thingamabobber some people swear by but I have yet to trust? While never having tried it myself, I'm not unfamiliar with silicone bakeware. Between testimonials from friends and plenty of reading on the Internet and in cookbooks, I have valid concerns about the adequacy of said bakeware and what it does to the integrity of my cakes. It's a challenge to take the cake out of the oven because it's not sturdy. As you're lifting the pan out, you might tear the cake as it wobbles around because it hasn't cooled and set yet. 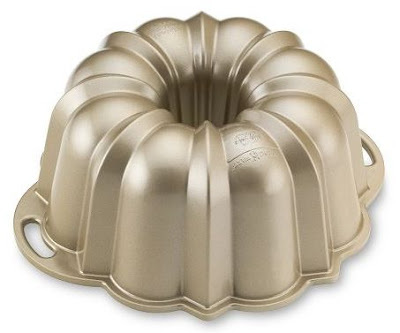 So now that you see what's been going through my mind, you can appreciate my queasiness when my friend presented me with her silicone bundt pan. At the same time, I was extremely curious to try it and break the ice already. What if it turned out to be earth-shattering, life-changing, and produced amazing cakes? I decided it was worth the risk. I do have one confession to make. As with plenty of scary things in life, baby steps are useful and make it easier to handle the challenge you're facing. So instead of diving right in and embracing the silicone pan for all its alleged goodness, I took the supposedly unnecessary measure of greasing and flouring the pan. Please don't mock me! My cake baked evenly in the pan, so that's relief #1. It also didn't stick to the pan one bit: relief #2 (though if you recall my confession, I may have tampered with the test a little). But on the downside, when I inserted a toothpick in the center and it needed about 10 more minutes to bake, it already looked done on the outside. I think it ended up overcooking the outside a little, just as I feared. The solution to that is to cover the cake with foil partway through baking so the outside doesn't burn while you give the inside a chance to finish baking. So while that downside is annoying, it's not a deal-breaker. I think the biggest problem I have with the pan is its flimsiness. As suspected, it wobbled when I took it out of the oven, even as I took extreme care to keep it still. The super hot cake is in a very fragile state immediately out of the oven, and its structure continues to set during the cooling. I almost broke the cake in half as I lifted it out of the oven because the silicone pan it was in was not supporting its still-setting delicate state. 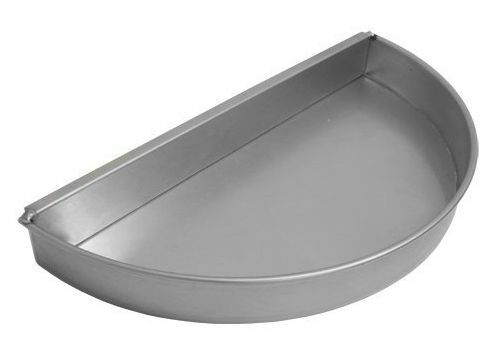 If I use this pan again, I will absolutely place the pan on a cookie sheet and bake it like that. 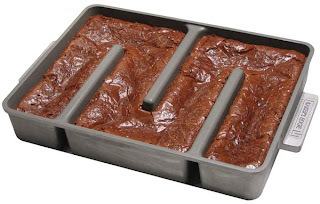 Not only does using a cookie sheet make it easy to lift the cake out of the oven, but the double thickness of having two pans will help prevent burning on the bottom of the cake. But the key here is if. If I will use this pan again. The fact that every time I use it it's going to give me butterflies is not good! But then again, last night's cake worked out, so maybe I'm panicking over nothing? At least now I can cross "using silicone bakeware" off the list of things to do before I die. Phew! 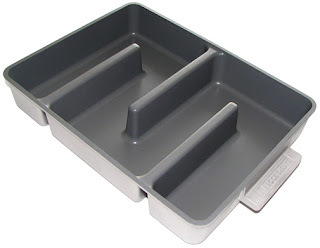 Have you ever used silicone bakeware? Are you a fan of it? Any disaster stories? Do tell! Making Waffles on the Stovetop? 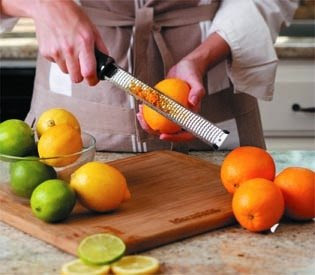 I just opened up an email from Williams-Sonoma advertising a new product, and it did what it was supposed to do! Caught my attention! 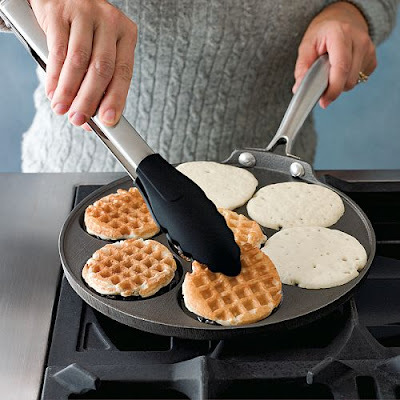 What is this Nordic Ware Waffle Pancake Pan all about? It seems like a great idea since pulling out the waffle maker can be a pain in the rear, not to mention cleaning it afterward. But does the pan really replace tried and true waffles made in a waffle maker? A stack of these breakfast goods made in the pan sort of resemble pancakes, and they're certainly cooked similarly, that is, on the stovetop, but maybe they magically taste like waffles instead. I am interested to find out! 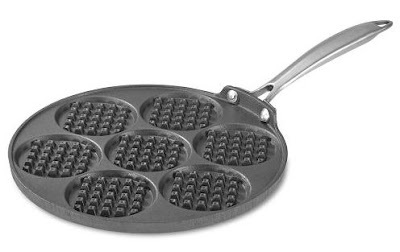 The pan is $39.95 and you can make 7 mini waffles at a time. 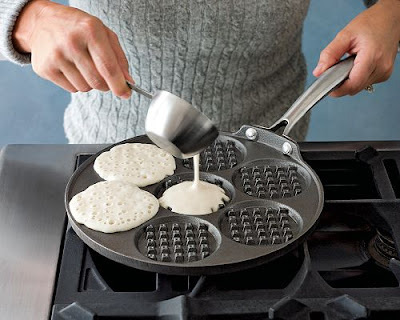 I was reading a 5-star review of the product by a Williams-Sonoma customer who tested out the pan, and she nicknamed the edibles "paffles." That is just genius. Paffles they are! I need this. 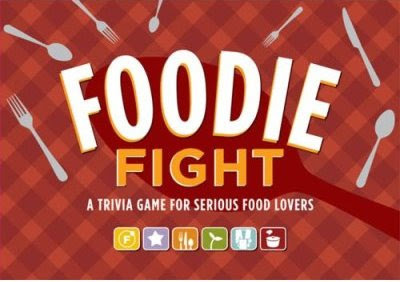 A trivia game designed just for foodies. You see, I play Trivial Pursuit on occasion, mostly when there's arm twisting involved (my arm). 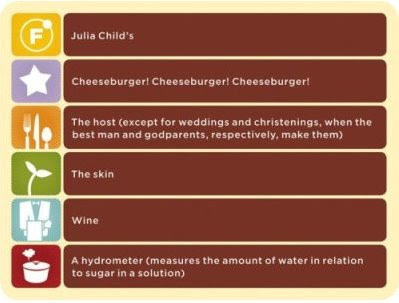 That's because the only questions I can really answer in Trivial Pursuit are food-related. Otherwise, I stink. 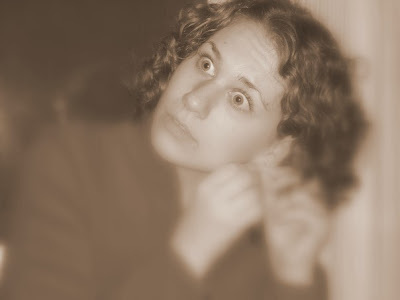 So imagine how my eyes bugged out (see below pic) when I heard about Foodie Fight! It's a deck of cards with over 1,000 foodie questions. Topics include culinary science, celebrity chefs, food history, exotic cuisine, and more. Check. Check. Check. Check. And check. I can handle all that. Now check your answers. How'd you do? I did (surprise surprise) well. 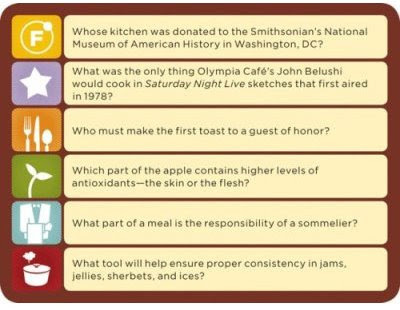 5/6 and the one I missed was the SNL question, which obviously belongs more in Trivial Pursuit. This is my kind of game.